The LORD said to Moses on Mount Sinai, "Speak to the Israelites and say to them: `When you enter the land I am going to give you, the land itself must observe a sabbath to the LORD. 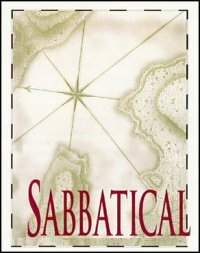 A Sabbatical is a biblical concept of rest and restoration after a period of intense work. God himself took the seventh day of creation and rested, not because he needed rest, but because he wanted man to know his finiteness and needed regular rest from his labors. Elijah is an example of a man of intense work who did not take time off and ended up burned out and full of self-pity. Other great men of God learned to pace their lives with long periods of silence, solitude, and a slower pace to seek God. Vance Havner said it well when speaking of Jesus' invitation to his disciples to, "Come apart and rest a while with me, or come apart." Genesis 2:2 And on the seventh day God ended his work which he had made; and he rested on the seventh day from all his work which he had made. 3 And God blessed the seventh day, and sanctified it: because that in it he had rested from all his work which God created and made. Exodus 23:17 Three times in the year all thy males shall appear before the Lord GOD. Feast of Unleavened Bread (Passover); "No one is to appear before me empty-handed. Feast of Harvest (First Fruits, Pentecost), Feast of Ingathering (Feast of Tabernacles) at the end of the year, "Three times a year all the men are to appear before the Sovereign LORD. Leviticus 23:3 "`There are six days when you may work, but the seventh day is a Sabbath of rest, a day of sacred assembly. You are not to do any work; wherever you live, it is a Sabbath to the LORD. 15 "`From the day after the Sabbath, the day you brought the sheaf of the wave offering, count off seven full weeks. 16 Count off fifty days up to the day after the seventh Sabbath, and then present an offering of new grain to the LORD. Mark 2:27-28 Then he said to them, "The Sabbath was made for man, not man for the Sabbath. So the Son of Man is Lord even of the Sabbath." "Making yourself do what you may not want to do because you know it is good for you." Why Take A Pastoral Sabbatical? "If I wait 'til retirement I won't remember what I had to say."